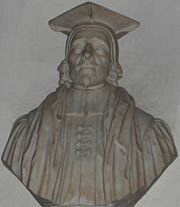 Bust of Edward Pococke, Christ Church, Oxford. Edward Pococke (1604 - 1691) was an English Orientalist and biblical scholar. After graduating from the University of Oxford, Pockocke spent the years 1630-1636 as an English Chaplain at Aleppo, where he continued his Arabic studies and collected some important manuscripts, many of which he later donated to the university. In 1636, he became the first Laudian of Professor of Arabic at Oxford. From 1648, he was also Regius Professor of Hebrew. 1648 to 1650 and again from 1660, he was a canon of Christ Church cathedral. He returned to the East in 1637, spending another three years there. During his long career at Oxford, he produced annotated translations of significant texts as well as Bible commentaries, especially during the Commonwealth period when his labors in Islamic history, philosophy and literature attracted suspicion. Even his coffee drinking was thought to be a sign of pro-Muslim sympathies. His collection of texts provided the bread and butter for work in Arabic studies through until the early nineteenth century. Although he thought Islam a false faith, he also wanted to discredit crude polemic, fabrications and folk-lore that misrepresented Islam and Muhammad. He helped to pioneer the use of primary sources as well as field-work in Muslim contexts. His defense of Muslim philosophy as a worthy subject of study prevented him from reducing Islam to legalistic aspects, even though he was disinterested in Islam as a living faith. He tended to approach Islam as he did ancient texts, as of historical rather than contemporary interest. He had relatively few students and since he wrote in Latin his approach did not impact on the public at large. However, he established standards for the academic study of Islam that did much to correct past errors, to making calumny and invention unacceptable. He made a significant contribution to knowledge of Islam's history within the West. Pococke is to be numbered among the founding fathers of Arabic and Islamic studies in the Western academy, along with the men who first occupied the chairs founded at Cambridge (1633), Paris (1535) and Leiden (1613). 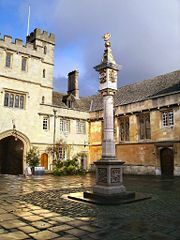 He was the son of clergyman from Chieveley in Berkshire, and was educated at Lord Williams's School of Thame in Oxfordshire and at Corpus Christi College, University of Oxford (scholar in 1620, fellow in 1628). He gained his BA in1622, his MA in 1626, his BD in 1636 and his DD in 1660. He was ordained a priest of the Church of England December 20, 1629. His interest in Oriental languages was encouraged by Matthias Pasor, a refugee from Germany who taught Hebrew, Aramaic, Syriac, and Arabic at Oxford. Pococke attended his classes from 1626-7, learning "the rudiments of Arabic." He continued to study under William Bedwell, who had worked on the King James Bible. In 1630, the Governors of the Levant Company, which traded within the Ottoman Empire where it had outposts (capitulations), decided to appoint a chaplain. Having heard good reports about Mr. Pococke, they offered him the post after hearing him preach. He was to be based at the consulate and factory at Aleppo. He arrived there in October 1630 and it was there that he would gain his "excellent knowledge of Arabic." Irwin describes his time there as "a studentship in Arabic and Islamic Studies." In addition to studying Arabic, first with a Jewish teacher, then with an Arab teacher he also acquired Arabic texts. Holt says that he collected "six thousand Arabic proverbs." While serving at the consulate in Aleppo, Pococke communicated with William Laud, then Chancellor of Oxford and later Archbishop of Canterbury. Laud asked him to take Arabic manuscripts back with him for the Bodleian Library. Laud was also contemplating founding a Chair in Arabic. When he did return to Oxford, the new Laudian Chair in Arabic was waiting for him. On his way back to England, he met Hugo Grotius in Paris. Pococke formally took up his chair on August 10, 1636. The first result of his studies was an edition from a Bodleian Library manuscript of the four New Testament epistles (2 Peter, 2, and 3 John, Jude) which were not in the old Syriac canon, and were not contained in European editions of the Peshito. However, in the summer of 1637, he decided to return to the East to collect more mss, this time mainly from Istanbul. While he was away, he left Thomas Greaves as his deputy at Oxford. When he returned to England Laud was in the Tower of London, but had taken the precaution to make the Arabic chair permanent, securing the endowment "on land in Berkshire." Pococke does not seem to have been an extreme in his religious views or to have been active in politics although he is usually described as a royalist. His rare scholarship and personal qualities brought him influential friends, foremost among these being John Selden and John Owen. Through their offices he obtained, in 1648, the chair of Hebrew which was attached to a canonry at the Cathedral. In 1650 he lost both chairs as the Commonwealth started to appoint Presbyterians to the University "but the Arabic Chair was soon restored to him since nobody could be found to take his place." Holt says that the canonry was taken off him because Oliver Cromwell's brother-in-law wanted it. He lost the stipends from these posts, though, and did not recover them until the Restoration in 1660. However, from 1643 he was incumbent of the parish of Childrey, a post he exercised with diligence, performing both his liturgical and pastoral duties and doing so without "flouting his learning." In 1660, he was confirmed as Regius Professor of History and as a canon of Christ Church Cathedral; Cromwell's brother-in-law, Peter French, had died in 1555. He still served his parishioners at Childrey. The Nave of Christ Church Cathedral, Oxford. The Cathedral is the College Chapel. The diocese was created after the English reformation using funds from the dissolution of the monasteries. Some Oxford professors automatically become members of the chapter, as did Pococke. Despite these events, Pococke continued with his research and writing although he used his parish duties as an excuse to spend more time away from the University. In 1649 he published the Specimen historiae arabum, a short account of the origin and manners of the Arabs, taken from Bar-Hebraeus (Abulfaragius), with notes from a vast number of manuscript sources which are still valuable. Irwin describes these notes as "copious" and as "based on Pococke's much more general knowledge of Middle Eastern history and culture." This was followed in 1655 by the Porta Mosis, extracts from the Arabic commentary of Maimonides on the Mishnah, with translation and very learned notes; and in 1656, by the annals of Eutychius in Arabic and Latin. He also gave active assistance to Brian Walton's polyglot bible, and the preface to the various readings of the Arabic Pentateuch is from his hand. He encouraged interest in Maimonides, whom he admired. He set his Hebrew students to work translating the Mishnah and Maimonides' commentary. After the Restoration, Pococke's political and financial troubles ended, but the reception of his magnum opus—a complete edition of the Arabic history of Bar-Hebraeus (Greg. Abulfaragii historia compendiosa dynastiarum), which he dedicated to the king in 1663, showed that the new order of things was not very favorable to his scholarship. "Few," he write in a letter to Greaves, seemed any more to think the subject "worthy taking notice of." The polygot bible itself received a mixed reception with "one critic" denouncing it as "affording a foundation for Mohammedanism; as a chief and principal prop of Popery; as the root of much hidden atheism in the world." After this his most important works were a Lexicon heptaglotton (1669) and English commentaries on Micah (1677), Malachi (1677), Hosea (1685), and Joel (1691), which are still worth reading. An Arabic translation of Grotius's De ventate, which appeared in 1660, may also be mentioned as a proof of Pococke's interest in the propagation of Christianity in the East. This was an old plan, which he had talked over with Grotius at Paris on his way back from Constantinople. In 1661, he also produced his Arabic translation of Grotius' De veritate religionis christianae which was printed in London at the expense of Robert Boyle. The theological works of Pococke were collected, in two volumes, in 1740, with a curious account of his life and writings by Leonard Twells. His best known work was "a translation of Ibn Tufayl's Hayy ibn Yaqdhan" published in 1671. Despite teaching at Oxford for over fifty years, he had few students although nominally medical students were required to gain some proficiency in Arabic. He spent many years working on a nine volume Arabic dictionary, which was not published until after his death. He was, however, a systematic teacher, assigning texts to his students then "meticulously analyzing nearly every word and concept" in his lecture. He may have had few students but he "almost single-handedly" equipped the next generation of Arabic scholars with, says Aston, "remarkable success." Quinn says that he also wrote poetry in Arabic. Irwin says that he was one of the first Englishmen to drink coffee, about which he wrote a short treatise. Apparently, drinking coffee was regarded as a dubious activity because it was associated with Islam. Pococke married in 1646. One of his sons, Edward (1648-1727), published several contributions from Arabic literature translating some of the mss that his father had lodged in the Bodlean, including Abd-el-latif's book on Egypt. Pococke was buried in Christ Church Cathedral, where he is honored by a bust. Netton comments that Pococke's long life, "spanning as it did most of the seventeenth century, was thus a contemporary witness of, and indeed ardent participant in, the first major flowering of Arabic studies in England." The texts from which he worked "formed the core of what was still being studied by Arabists right up to the early nineteenth century." He was sympathetic towards his subject matter and his Specimen historiae arabum marked a move away from polemic towards a serious engagement with Islamic history or Islamic sources. He argues for the importance of Arabic studies "not only for access to works on medicine but so that Christians could "dispose of common fables and errors." Instead of trying to refute false errors that had been "fathered onto the followers of the prophet" they could "refute genuine Muslim errors." Pococke thought it better to "study the Quran and its commentaries critically than waste time fabricating" silly stories about Muhammad. He omitted some inaccuracies from Grotius, after corresponding with him about the source and learning that Grotius had no Muslim authority. He also argued that Islamic philosophy merited study much more than the "barbarous translations made in the Middle Ages" suggested. Quinn comments that while he was in the east he enjoyed friendships with Muslim but also says that he treated Islam as if it "ancient history" Netton characterizes his interest in Islam as one that focused on the "exotic" or "esoteric" Pococke was still hostile towards Islam as a religion but, says Irwin, "his was a kind of hostility that was conducive to sound scholarship, as he was particularly concerned to discredit Western folklore and crude polemical lies about" Islam. Holt concludes that on the one hand Pococke's work was "limited in scope" because it was mainly translation and did not include some of the main Islamic sources. On the other hand, he made "an outstanding contribution to historical knowledge." Dabiel says that he "provided material on the rise of Islam that was closer to the original sources than anything contemporary scholarship was accustomed to." However, this scholarship, as well as ignoring major sources for knowledge of Islam, also ignored its "living spirituality." Pococke, for example, did not consult the earliest lives (sira) of Muhammad although he was familiar with the later work of Abu-al-Fida. On the other hand, his interest in Muslim philosophy meant that he refused to reduce Islam, as many non-Muslim scholars do, to its legal aspects all but suggesting that Muslim theology and philosophy are aberrations. Yet, Pococke's work was part of a significant paradigm shift in European writing about Islam. Increasingly, accuracy replaced fabrication. Increasingly, primary sources or sources close to the original, were preferred over secondary sources. Increasingly, checking the accuracy of an account against Muslim authorities became standard. Increasingly, those who wrote about Islam knew Muslims personally, as Pococke did and spent time in Muslim contexts. He can also be considered to have pioneered field work. Pococke was not a popular writer in that he wrote in Latin and translated into Latin not into English. He had few students, so can not be said to have exercised wide influence. Nonetheless, by setting academic standards he set the stage for future scholars to produce work for a more general readership that continued to challenge inaccuracy, to correct errors and to use mainly Muslim sources to communicate what Muslims actually do believe instead of what other people say they do. ↑ 1.0 1.1 Netton (1996), 6. ↑ 5.0 5.1 Holt (1973), 8. ↑ Aston, and Tyacke (1997), 470. ↑ Aston and Tyacke (1997), 498. ↑ 12.0 12.1 Quinn (2008), 65. ↑ Aston and Tyacke (1997), 489. ↑ Aston and Tyacke (1997), 490. ↑ 15.0 15.1 15.2 Irwin (2006), 97. ↑ 17.0 17.1 Holt (1973), 11. ↑ 18.0 18.1 Irwin (2006), 94. Aston, Trevor Henry, and Nicholas Tyacke. 1997. The History of the University of Oxford. Vol. 4, Seventeenth-century Oxford. Oxford, UK: Clarendon. ISBN 9780199510146. Bar Hebraeus, and Edward Pococke. 1650. Specimen Historiae Arabvm; sive, Gregorii Abul Farajii Malatiensis De origine & moribus Arabum succincta narratio, in linguam latinam conversa, notisque è probatissimis apud ipsos authoribus, fusiùs illus., operâ & studio Edvardi Pocockii. Oxoniae, UK: excudebat H. Hall. Daniel, Norman. 2000. Islam and the West: The Making of an Image. Oxford, UK: Oneworld. ISBN 9781851681297. Holt, P.M. 1973. Studies in the History of the Near East. London, UK: Cass. ISBN 9780714629841. Ibn Ṭufayl, Muḥammad ibn ʻAbd al-Malik, and Lenn Evan Goodman. 2003. Ibn Tufayl's Hayy ibn Yaqzān: A Philosophical Tale Translated with Introduction and Notes. Los Angeles, CA: Gee tee bee. ISBN 9780917232374. Irwin, Robert. 2006. Dangerous Knowledge: Orientalism and its Discontents. Woodstock, NY: Overlook Press. ISBN 9781585678358. Netton, Ian Richard. 1996. Seek Knowledge: Thought and Travel in the House of Islam. Richmond, Surrey, UK: Curzon Press. ISBN 9780700703395. Pococke, E., and L. Twells. 1740. The Theological Works of the learned Dr. Pocock, Sometime Professor of the Hebrew and Arabick Tongues, in the University of Oxford, and Canon of Christ-Church: containing his Porta Mosis, and English commentaries on Hosea, Joel, Micah, and Malachi. To which is prefixed, an account of his life and writings, never before printed; with the addition of a new general index to the Commentaries. London, UK: Printed for the editor, and sold by R. Gosling, at the Mitre and Crown in Fleet-Street. Quinn, Frederick. 2008. The Sum of All Heresies: The Image of Islam in Western Thought. Oxford, UK: Oxford University Press. ISBN 9780195325638. Toomer, G.J. 1996. Eastern Wisedome and Learning: The Study of Arabic in Seventeenth-Century England. Oxford, UK: Clarendon Press. ISBN 9780198202912. Tyacke, Nicholas. 1997. Seventeenth-Century Oxford. Oxford, UK: Clarendon Press. ISBN 9780199510146. Royal Berkshire History: Edward Pococke. This page was last modified on 22 September 2017, at 20:24.